We have been playing outside so much recently. Our sandbox is right outside and the kids are in there daily. We added a little color to some of the sand this week and have been having fun with our colored sand! 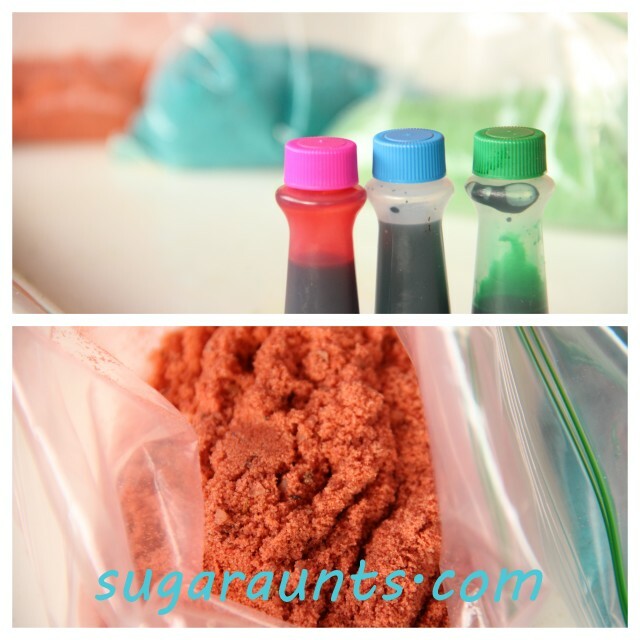 We made a simple batch of colored sand very easily. Big Sister helped me with this and we had fun while the little kids were napping. So how did we make our colored sand? Scoop a little sand into plastic baggies. Add around 10-15 drops of food coloring. 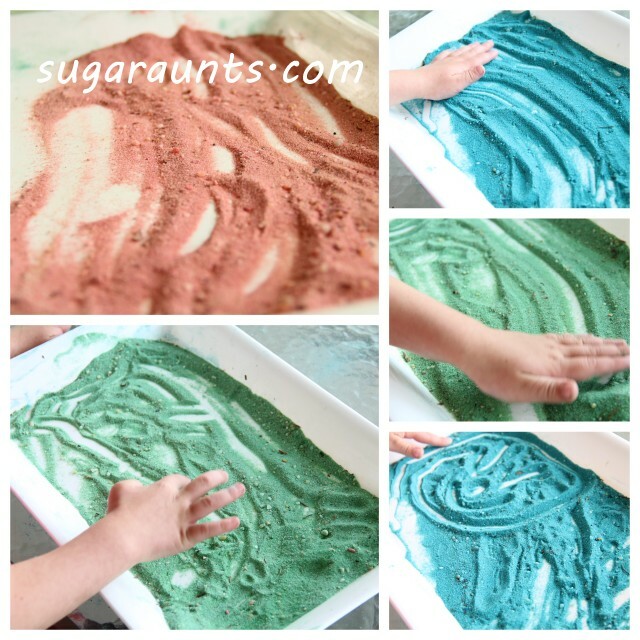 So the next day, we spread the sand out on a tray and played! She loves making pictures in the sand and telling stories (like Nina on Sprout!) This was such a fun activity. She told me all kinds of stories, made words, and we practiced some lower case letter formation. Big Sister is knows how to make most lowercase letters and can copy all of the letters. This is a great activity for letter formation and practicing handwriting. The sand adds a sensory aspect to letter formation. Using a large tray like this one adds whole arm movements which are perfect for the young child who is just learning letter formation. I love the contrast that the white tray adds to the colored sand. We played for a long time with this (again during Little Kid nap time). How can you grade this activity for different aged children? Toddlers would love to explore the colors and sensation of the sand on their fingers. Early writers can trace upper case letters. Older hand-writers can copy a word from a card positioned off to the side. Practice spelling words with school-aged kids. We saved our bags of colored sand and will be using them again. 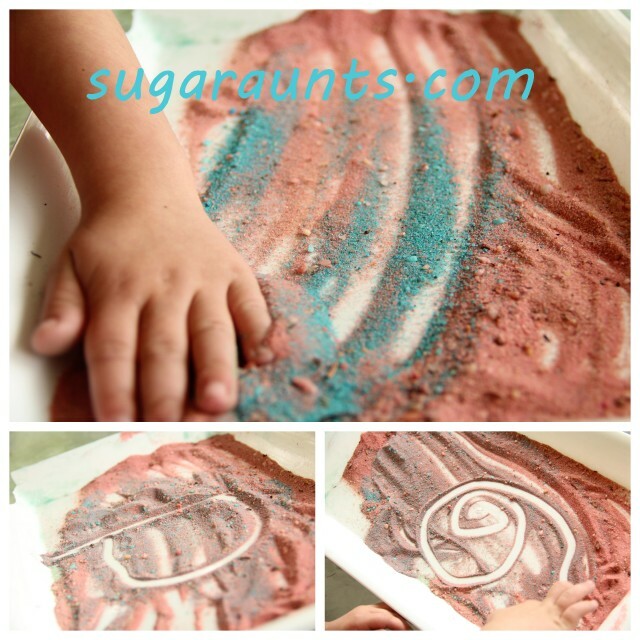 Have you done any projects with colored sand?